The extremely popular Mazda3 compact car gets a larger 2.5-liter engine and a new six-speed manual transmission this model year, while the rest of the car's standard features carry over from its 2014 predecessor. 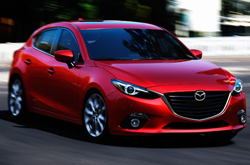 The 2015 Mazda3 offers excellent customizable features, thanks to its two body styles, as well as its two main trim levels and many sublevels. Compact car shoppers can choose between either a four-door sedan or a hatchback body style on the 2015 Mazda3 in Springfield, as well as two trim levels: 3i and 3s. Choose the base Mazda3 trim (sedan only) and you'll get a trip computer, a four-speaker sound system, a folding rear seat, 16-inch steel wheels, full power accessories and an auxiliary audio input. The next level i Sport trim adds Bluetooth connectivity, a six-speaker sound system, a 7-inch touchscreen and smartphone-enabled internet radio. The i Touring trim gets 16-inch alloy wheels, heated side mirrors, a leather-wrapped steering wheel, a rearview camera, a rear spoiler and keyless entry/ignition. Finally, the i Grand Touring gets leatherette upholstery, manual driver seat lumbar adjustment and heated front seats. The s trim comes in two sub-trims: s Touring and s Grand Touring. The s Touring trim comes with similar features as the i Grand Touring, but adds 18-inch alloy wheels, a head-up display, a more powerful engine and steering-wheel-mounted paddle shifters. Our 2015 Mazda3 review loves the Mazda3 s Grand Touring trim, which finishes the full Mazda3 lineup with automatic wipers, leather upholstery, an auto-dimming rearview mirror and adaptive bi-xenon headlights. Under the hood, look for the base Mazda3 models to come with a 2.0-liter four-cylinder engine that rates at 155 horsepower and your choice of a standard six-speed manual or six-speed automatic transmission. The next level Mazda3 models come with a 184 horsepower 2.5-liter four-cylinder engine that is also paired with your choice of either a manual or automatic transmission. 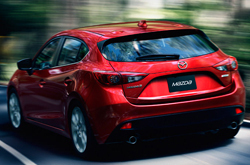 Stop by our showroom today and test drive the new 2015 Mazda3 in Springfield! For more information, including a video review and model pics, keep reading our 2015 Mazda3 review. 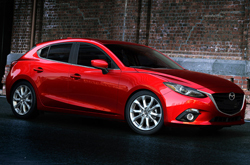 The 2015 Hyundai Elantra, Honda Civic and the Chevy Cruze are eclipsed by the 2015 Mazda3 in many areas. If the Mazda3's low MSRP and state-of-the-art onboard technologies don't persuade you that it's the best vehicle for your needs, we're sure its eye-catching exterior design will seal the deal. 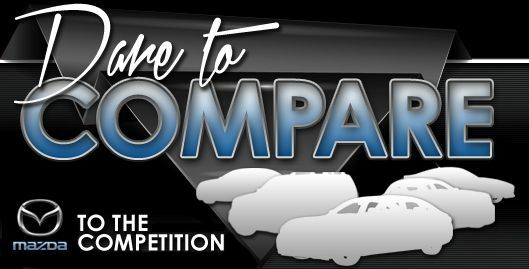 It's a remarkable value, which you'll easily see when comparing its price to the vehicles in its class. The bullet list under this text will give you even more information! Thank you for reading our complete 2015 Mazda3 review, written by Reliable Mazda's automotive authors. Not all Springfield car dealers are alike. We differ from others in that we feel it's our job to equip customers with quality reviews. Make intelligent decisions when it comes to your next auto purchase - don't take guesses! Each section is bundled with information and vehicle features in a set-up that's easy to understand. Find out more about our fantastic selection of vehicles; visit the research index to review and compare other models on the lot at Reliable Mazda now!